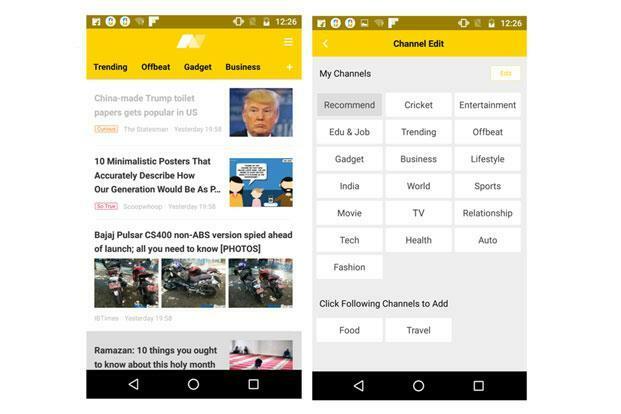 UCWeb launches UC News app for India: Too late in the battle ? Chinese software company UCWeb, better known for its UC Browser app for Android and iOS devices, has come up with a news aggregator app. However, just like in the case of browsers where it faced competition from Google’s Chrome and Opera, the UC News app faces competition from rivals such as Flipboard, News Republic or Google’s News and Weather app. Would we pick this over the other three? Lets find out. UC News’ interface looks very basic in comparison with Flipboard and News Republic. UC News has a clutter-free interface. The stories are arranged under various interest-based categories in vertical columns. Swiping towards right to move to the next category works smoothly, while pulling down refreshes stories in all the categories and not just one. You can add and remove any of the categories you want by tapping on the + icon on the top of the page. As of now, the app supports English and Hindi publications only. Which means you can read news stories not just in English, but in Hindi as well and from all leading Hindi web sites. This is good, but not unique. You can read news sources in Hindi in Flipboard and News Republic too, with News Republic in particular offering a lot of content from a number of Hindi publications. UC News’ interface looks very basic in comparison with the other two. Flipboard has multiple pages, yet it’s easy to use and also looks visually appealing. It not just allows users to select their categories but also select the publications they wish to follow. Its home page collates the top stories from the users’ list of favourite publications just in case the users don’t have time to go through each category. One of the key highlights of Flipboard is the vertical flip which divides a story in several small pages allowing users to keep tab of the progress in longer stories. News Republic has a very minimalistic layout and uses hidden side screens to show the categories instead of cluttering the home page. Another major news app which comes preloaded on most Android devices is Google’s News & Weather app, which shows the most popular stories on Google News in a mobile-friendly format. Stories are cataloged under sections and you can see the top ten most trending story items in each of them. The recent update has added the option to read the story within the app so you won’t be redirected to the Chrome browser when you want to read a story. The layout is plain and mostly text-centric but you can switch to a dark theme for reading at night. What gives Flipboard and News Republic an edge over the UC News is the sheer amount of content they offer. There are more categories and all major international publications and websites based on language and country are available on them. One of the highlights of Flipboard is the option to login to one’s social media profile and access news posted by a friend on Facebook, Twitter and Google+ from within Flipboard. Similarly, News Republic has the option where you can see the public reaction to a story. Also, it can read the text in the story in case you don’t want to read it. Though Google News & Weather app doesn’t have a Hindi language option (it’s available on the browser version), you can always get news that is trending in other countries by changing the edition in the settings page. The latest weather update is a bonus which you won’t get on any of the other news apps. Is UC News worth downloading? UC News, though it is doing the content and interface bit quite well, really offers nothing unique which you won’t get on News Republic, Flipboard or Google News & Weather already. And if an app eventually becomes a habit, it is quite hard to move away from it. And for all its positives, UC News is arriving a bit too late in the news app space, without any really unique elements.